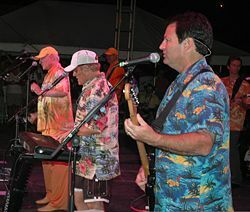 The Beach Boys are one of the most successful American rock and roll bands. Formed in 1961, the group gained popularity for its close vocal harmonies and lyrics reflecting the California youth culture of surfing, young romance, and cars. Band leader Brian Wilson's growing creative ambitions later transformed the group into a more artistically innovative band that earned critical praise and influenced many later musicians. The Beach Boys' hits included "Surfin' U.S.A.," "I Get Around," "Help Me, Rhonda," "Good Vibrations," and many others. Their album Pet Sounds is considered by many critics to be an innovative masterpiece and was credited by Paul McCartney to have inspired the Beatles' classic album Sergeant Pepper's Lonely Heart's Club Band. The Beach Boys were inducted into the Rock and Roll Hall of Fame in 1988. They have had 36 U.S. Top 40 hits, the most of any U.S. rock band, and 56 Hot 100 hits, including four number one singles. In his teenage years in Inglewood, California, Brian Wilson watched his father, Murry, play piano and listened intently to the harmonies of vocal groups like The Four Freshmen. He and his brothers practiced emulating the close harmonies of these groups. For his sixteenth birthday, Brian received a reel-to-reel tape recorder and learned how to overdub. Listening to band leader Johnny Otis on his KFOX radio show, Brian was inspired by the simple structure and vocals of the rhythm and blues songs he heard, influencing his piano-playing style. He also started writing songs, but his new musical interests interfered with his music studies at school. He failed to complete a twelfth-grade piano sonata, but did submit an original composition, called "Surfin'." 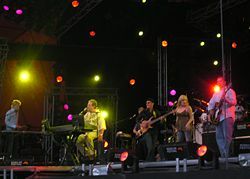 The group initially comprised singer-musician-composer Brian Wilson, his brothers, Carl and Dennis, their cousin Mike Love, and friend Al Jardine. After receiving accolades from friends and classmates from early public performances with various groupings the "the Beach Boys sound" began to form in Brian's bedroom, mainly through experiments with his brothers and cousin. Originally called the Pendletones, the Beach Boys soon developed a repertoire that memorialized the California youth culture. Dennis was the only member of the group who actually surfed. It was he who had suggested that his brothers compose some songs celebrating the lifestyle which had developed around surfing in Southern California. On October 3, 1961, the Pendletones recorded 12 takes of "Surfin'," and a small number of singles were pressed. When the boys unpacked the first box of singles, on the Candix Records label, they were surprised and angered to see their band name had been changed to "Beach Boys." Their limited budget meant the labels could not be reprinted. Released mid-November 1961, "Surfin'" was soon aired on KFWB and KDAY, two of Los Angeles' most influential radio stations. It was a hit on the west coast, and peaked at number 75 on the national pop charts. 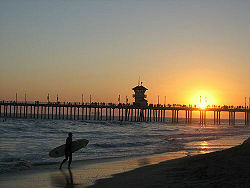 The Huntington Beach pier in Southern California. Murry Wilson, father of the Wilson boys, effectively seized managerial control of the band without consultation, but Brian acknowledges that Murray "deserves credit for getting us off the ground." Murry, who did not think highly of "Surfin'," saw the band's financial potential and stressed the importance of quickly creating a follow-up hit. The group duly recorded demo versions of four more originals, including "Surfer Girl," "409," and "Surfin' Safari." Although these songs would go on to become major hits, the session ended on a bitter note, as Murry demanded that the Beach Boys record some of his own songs, insisting that "My songs are better than yours." On July 16, on the strength of the June demo session, the Beach Boys were signed to Capitol Records. By November, their first album was ready, titled Surfin' Safari. Their song output continued along the same commercial line, focusing on California youth lifestyle. The Beach Boys’ early success contributed significantly to the popularity of surfing worldwide. The group also celebrated the Golden State’s obsession with hot-rod racing ("409," "Little Deuce Coupe") and the pursuit of happiness by carefree teens in less complicated times ("Be True to Your School," "Fun, Fun, Fun," "I Get Around"). The band's early hits made them major pop stars in the United States and other countries, although their status as America's top pop group was usurped in 1964, by the emergence of The Beatles, who became the Beach Boys' major creative rival. Although their music was bright and accessible, these early works belied a sophistication that would emerge more forcefully in the coming years. During this period, Brian Wilson rapidly progressed to become a melodist, arranger, and producer of world-renowned stature. 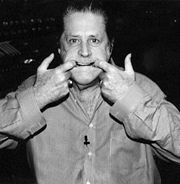 Suffering from the stress of a high-profile lifestyle, Brian Wilson suffered an anxiety attack while on a flight to Houston on December 23, 1964, and withdrew from the rest of the band's scheduled tour. Shortly afterward, he announced his withdrawal from touring altogether to concentrate entirely on songwriting and record production. Glen Campbell served as Wilson's replacement in concert, until his own career success motivated him to leave the group. Bruce Johnston replaced Campbell and became a full-time member of the touring band and later contributed his talents in the studio as well. During this time, Brian was able to expand his role as a producer. He also wrote "Surf City" for Jan & Dean, the Beach Boys' opening act. The Jan & Dean recording hit number one on the U.S. charts in the summer of 1963, a development that pleased Brian but angered Murry, who felt his son had "given away" what should have been the Beach Boys' first chart-topper. A year later, the Beach Boys would notch their own number one single with "I Get Around." As Wilson's musical efforts became more ambitious, the group relied increasingly on professional session players on tracks such as "I Get Around" and "When I Grow Up (To Be a Man)." "Help Me, Rhonda" became the band's second number 1 single in the spring of 1965. The 1965 album Today! featured less focus on guitars, more emphasis on keyboards and percussion, and increased lyrical maturity. The Beach Boys followed up their "California Girls," which reached number three in November 1965, with another top 20 single, "The Little Girl I Once Knew," considered to have been the band's most experimental statement to date. It was only the band's second single not to reach the top ten since their 1963 breakthrough. Later that year, they would score a number two hit with the single "Barbara Ann," released in December. It is one of their most recognized songs and has become legendary over the years, due to its catchy bass vocal "hook." Wilson's growing mastery of the recording studio and his increasingly sophisticated arrangements would reach a creative peak with the acclaimed LP Pet Sounds (1966). The tracks "Wouldn't It Be Nice" and "God Only Knows," showcased Wilson's growing mastery as a composer, arranger, and producer. The album's meticulously layered harmonies and inventive instrumentation set a new standard for popular music and is still widely regarded as a classic of the rock era. Among other accolades, Paul McCartney has named it one of his favorite albums of all time (with "God Only Knows" as his favorite song). McCartney has also said that it was a major influence on the Beatles' album, Sgt. Pepper's Lonely Hearts Club Band, while Wilson has likewise indicated that he was inspired to make Pet Sounds by listening to The Beatles' Rubber Soul. Despite the critical praise it received, the album was indifferently promoted by Capitol Records and failed to become the major hit Brian had hoped it would be, reaching only number ten. Seeking to expand on the advances made on Pet Sounds, Wilson began an even more ambitious project. Its first fruit was "Good Vibrations," which Brian described as "a pocket symphony." The song became the Beach Boys' biggest hit to date. It reached number one in both the U.S. and the UK in 1966, and many critics consider it to be one of the best rock singles of all time. It was also one of the more complex pop productions ever undertaken, and was reputed at the time to have been the most expensive American single recorded. While putting the finishing touches on Pet Sounds, Brian met fellow musician and songwriter Van Dyke Parks. The two began an intense collaboration that resulted in a suite of challenging new songs for the Beach Boys' next album, which was eventually named Smile. Recording began in August 1966, and carried on into early 1967. Wilson and Parks intended Smile to be a continuous suite of songs that were linked both thematically and musically, with the main songs being joined together by small vocal pieces and instrumental segments that elaborated upon the musical themes of the major songs. However, some of the other Beach Boys, especially Love, found the new music too difficult and too far removed from their established style. Moreover, the new music was simply not feasible for live performance by the current Beach Boys lineup. After a heated argument with Love, Parks walked out of a recording session, and shortly thereafter his creative partnership with Wilson came to an end. In May 1967, Smile was shelved, and over the next 30 years, the legends surrounding Smile grew until it became the most famous unreleased album in the history of popular music. After "Good Vibrations," the Beach Boys faced a period of declining commercial success. The group's image problems took a further hit following its withdrawal from the bill of the 1967 Monterey International Pop Festival. As Brian's mental and physical health deteriorated in the late 60s and early 70s, his song output diminished and he became increasingly withdrawn from the group. To fill the void, the other members began writing songs. Carl Wilson gradually took over leadership of the band, developing into an accomplished producer. Having left Capitol Records, the Beach Boys reactivated their Brother Records label in 1970, and also signed with Reprise Records. With a new contract, the band appeared rejuvenated, releasing the album Sunflower, to critical acclaim. However, the album produced the band's worst chart performance ever, not even making the top 100. After Sunflower, the band hired Jack Rieley as their manager. Rieley chose a different direction for the group, emphasizing, among other things, political and social awareness. The result was 1971's Surf's Up. The album was moderately successful, reaching the U.S. top 30. While the record made its run on the charts, the Beach Boys added to their refound fame by performing a near-sellout concert at Carnegie Hall and following it with an appearance with the Grateful Dead at Fillmore East on April 27, 1971. The addition of Ricky Fataar and Blondie Chaplin in February 1972, led to a dramatic departure in sound for the band. The album Carl and the Passions—"So Tough" was an uncharacteristic mix that included several songs drawn from Fataar and Chaplin's previous group, Flame, which are nearly unrecognizable as Beach Boys songs. The group developed an ambitious plan in developing its next project, Holland. The band, family members, assorted associates, and technicians moved to the Netherlands for the summer of 1972, eventually renting a farmhouse to convert into a makeshift studio. The band was enthusiastic about the results, but Reprise felt that the album was weak. After some wrangling between the camps, the band asked Brian to come up with pre-commercial material. This resulted in the song "Sail On, Sailor," a collaboration between Brian Wilson and Van Dyke Parks. Reprise approved, and the album was released early 1973, peaking at number 37 on the Billboard album chart. Holland was also popular on FM radio, which embraced tracks like Mike Love and Al Jardine's "California Saga." Holland proved that the band could still produce contemporary songs with wide (if not mass) appeal. Despite the indifference displayed by the record label, the band's concert audience started to grow. The Beach Boys in Concert, a double album documenting the 1972 and 1973 U.S. tours, became the band's first gold record for Reprise. In the summer of 1974, Capitol, in consultation with Love, released a double album compilation of the Beach Boys' pre-Pet Sounds hits. Endless Summer, helped by a sunny, colorful graphic cover, caught the mood of the country and surged to number one on the Billboard album chart. It remained on the album chart for three years. The following year, another compilation, Spirit of America, also sold well. These compilations revived interest in the classic Beach Boys sound. In 1975, the Beach Boys staged a highly successful joint concert tour with Chicago. Beach Boy vocals were also heard on Elton John's 1974 hit, "Don't Let the Sun Go Down on Me." With the release of "Endless Summer," the Beach Boys suddenly became relevant to the American music landscape again. Rolling Stone awarded the band the distinction of 1974's "Band of The Year," solely based on the their juggernaut touring schedule and material Brian Wilson had produced over a decade before. Nostalgia had settled into the Beach Boys identity. The group did not produce any albums of new material from 1973 to 1976. Their concerts continuously sold out, with old material becoming the bulk of the act. Brian Wilson returned as a major force in the group with 15 Big Ones, the first album produced by him since Pet Sounds. The album was publicized by an NBC-TV special, telecast on August 4, 1976, simply titled The Beach Boys, which was produced by Saturday Night Live creator Lorne Michaels and featured appearances by SNL cast members John Belushi and Dan Aykroyd. In the late 1970s, some of the group's concert appearances were marred when band members showed up on stage visibly high on alcohol or drugs. The band was forced to apologize publicly after a poor performance in Perth, Australia, in 1978. Brian Wilson in concert in 2005. The band rebounded in 1980, when it played a Fourth of July concert on the National Mall in Washington, D.C. before a large crowd. This concert was repeated in the next two years, but in 1983, Secretary of the Interior James Watt blocked the group from playing on the Mall, saying that rock concerts drew "an undesirable element." This drew howls of outrage from many of the Beach Boys' American fans—many now Republicans in their 40s—who stated that the Beach Boys sound was a very desirable part of the American cultural fabric. First Lady Nancy Reagan apologized, and in 1984, the group appeared on the Mall again. Many changes in both musical styles and personnel have occurred during their career, notably because of Brian Wilson's mental illness and drug use (leading to his eventual withdrawal from the group) and the deaths of Dennis and Carl Wilson in 1983 and 1998, respectively. Extensive legal battles between members of the group have also played their part. After Carl Wilson's death, founding member Al Jardine was ousted by Mike Love. Love and Bruce Johnston then leased the rights to the band's name and continued to tour as the Beach Boys. Although divisions have plagued the group in recent decades, on June 13, 2006, the major surviving Beach Boys—Brian Wilson, Mike Love, Al Jardine, Bruce Johnston, and David Marks—set aside their differences and reunited for a celebration of the fortieth anniversary of the album Pet Sounds. The reunion also celebrated the double-platinum certification of their greatest hits compilation, Sounds of Summer: The Very Best of the Beach Boys, in a ceremony atop the Capitol Records building in Hollywood. The Beach Boys were inducted into the Rock and Roll Hall of Fame in 1988. The band was chosen for the Vocal Group Hall of Fame in 1998. In 2001, the group received the Grammy Lifetime Achievement Award. Brian Wilson was inducted into the UK Rock and Roll Hall of Fame in November 2006. In 2004, Rolling Stone Magazine ranked the Beach Boys number 12 on its list of the 100 Greatest Artists of All Time. In 2007, the Beach Boys were inducted into the Hit Parade Hall of Fame. Although the Wilsons' Hawthorne, California house, where the Wilson brothers grew up and the group began, was demolished in the 1980s to make way for Interstate 105, a Beach Boys Historic Landmark, dedicated on May 20, 2005, marks the location. Dennis and Carl Wilson died in 1983 and 1998, respectively. Brian Wilson's mental illness and drug use lead to his eventual withdrawal from the group. Extensive legal battles between members of the group have also played their part. After Carl Wilson's death, founding member Al Jardine was ousted by Mike Love. Love and Bruce Johnston then leased the rights to the band's name and continued to tour as the Beach Boys. At this writing they still tour the United States, Europe, and many other countries under the name of the "Beach Boys Band." ↑ All Music, The Beach Boys Overview. Retrieved July 7, 2008. Carlyn, Patrick Ames. Catch a Wave: The Rise, Fall & Redemption of the Beach Boys' Brian Wilson. Emmaus, Pa.: Rodale. ISBN 978-1594863202. Ganes, Steven S. Heroes and Villains: The True Story of the Beach Boys. New York: New American Library, 1986. ISBN 978-0453005197. Tobler, John. The Beach Boys. Secaucus, N.J.: Chartwell Books, 1978. ISBN 978-0890091746. White, Timothy. The Nearest Faraway Place: Brian Wilson, the Beach Boys, and the Southern California Experience. New York: H. Holt, 1994. ISBN 978-0805022667. Wilson, Brian, and Todd Gold. Wouldn't It Be Nice: My Own Story. New York: HarperCollins, 1991. ISBN 9780060183134. All links retrieved May 8, 2014. History of "The Beach Boys"
This page was last modified on 8 May 2014, at 14:56.